The Nike Kobe 10 Elite “American” is a brand new patriotic Nike Kobe 10 that honors United States leaders of the past that Kobe was inspired by with Red stars and stripes. Featuring a USA-inspired combination of University Red, White, Obsidian, and Bright Crimson. The shoe features a Red Nike Flyknit upper with Obsidian detailing throughout, White hitting the Nike Swoosh logos and star print visible on each tongue tag. Check out the official images below and look for the Nike Kobe 10 Elite “American” to release on Tuesday, November 24th, 2015 at select Nike Basketball retail stores. The retail price tag is set at $225 USD. UPDATE: The Nike Kobe 10 Elite “American” makes its debut tomorrow to select Nike Basketball retailers worldwide. Check out the latest images via ATAF. 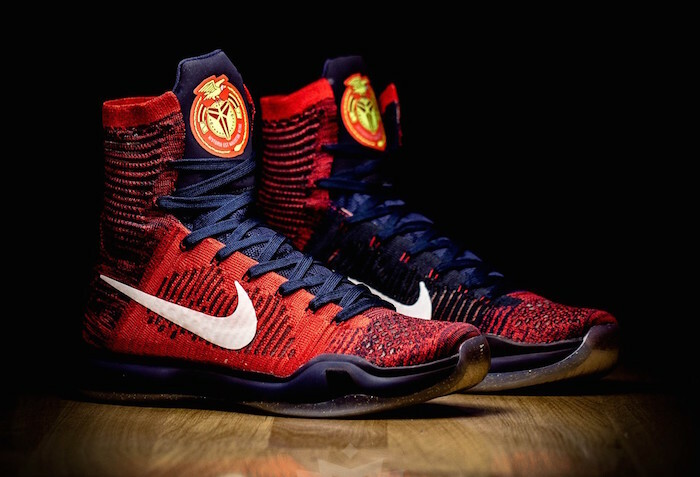 UPDATE: Nike has officially unveiled the “American” Nike Kobe 10 Elite that will be debuting on November 24th.